We often have clients ask us about coverings for doors versus coverings for windows. Contrast in interior design can give a room more depth, interest, or style. This is true for window and door coverings, too. It’s okay to have one type of window covering in one room, and a different type in another — or even in the same room! And when you’re considering your design options for windows and doors, contrast is sometimes a necessity. Certainly, style is a top priority. But without the perfect functionality, you’ll find even the most beautiful window treatments won’t last long. A door serves a much different purpose than a window, which means it should be looked at differently from a style perspective, too. For example, if your living room has two windows and a sliding glass door, and your adjacent kitchen has a large but short window over the sink and a skylight, you have several distinct window covering needs. Size and orientation: Doors are often floor to ceiling. Windows are typically about 30-40″ above the floor. Frame: Doors are usually flush with the wall, while most windows have a frame which allows for inside-mount if desirable. If you have honeycomb shades on your windows, try custom draperies or Vertiglide® by Hunter Douglas on your sliding glass door. 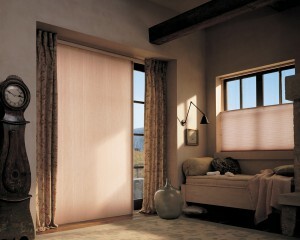 If you have wood blinds on your windows, try vertical blinds or complementary custom-made curtains on your doors. If you have bamboo woven wood shades on your windows, try vertical woven wood panels on your door. If you have Hunter Douglas’s Silhouette® shadings on your windows, try Hunter Douglas’s Luminette® Sheers on your door. If you have roman shades on your windows, try split-draw drapes on your door.